In first pAsuram, parAnkuSa nAyaki [AzhwAr in feminine mood] says “There is no use with my best bodily complexion which is not desired by emperumAn who is a great guNavAn (one with good qualities) and who is capable of destroying the enemies”. kuRaivu ilam – there is no use. emperumAn is having a unique and spiritually distinguished divine body which is individually enjoyed and considered to be their own abode by rudhra who considers himself to be the ISvara and is having the bull as his vehicle, chathur mukha brahmA who is qualified to engage in variegated creation and SrI mahAlakshmi who is inseparable from him and who is his wealth; there is no use of my radiant complexion when it is not desired by emperumAn who is hostile controller and who, vowing in his divine heart, took up weapons and fought groups and groups of asuras to transform them into partices of dust. ERALum … – parAnkuSa nAyaki tells “I have lost the divine form [body of emperumAn] which is the abode for even those who are very prideful”. She says “I am unable to attain what is attained even by a kApAli and kandhan [Both indicating rudhra – kApali – one who is having skull in his hand, kandhan – one who is wearing torn clothes; another explanation kandhan indicates brahmA who is born in the lotus in the divine naval of emperumAn]”. ERALum – When sarvESvara has periya thiruvadi (garuda) who is vEdhAthmA (the soul of vEdham) as his vehicle, rudhra too, like wandering mendicants, pridefully thinks ‘I have a bull as my vehicle’. ALum – This is his [rudhra’s] ubhaya vibhUthi [sarcasm – as emperumAn is ruling over spiritual and material realms, here rudhra is said to be ruling over the bull]. iRaiyOnum – emperumAn is the sarvESvara controlling ubhaya vibhUthi; as [a small/useless] kaLLi (spurge) plant is mistaken as mahA vruksha (great tree), he [rudhra] considers himself to be ISvara. [This is to explain that bhagavAn is not the same as other dhEvathAs ever] While dharma [form/attribute] and dharmi [soul/substratum] have aikyam [indicated in unison], two dharmis [souls] have no aikyam [cannot be indicated as the same] [Here it is only talking about aikyam at the SarIra-SarIri level, that is, a soul and body are considered to be united and always indicated together. But there is no svarUpa aikyam, that is, the entities themselves (soul and body) are different from each other]. thisai muganum – One who is having four heads to recite four vEdhams through each mouth to engage in creation and who pridefully thinks that he is the creator. thirumagaLum – And periya pirAttiyAr who is as explained in SrI rAmAyaNam sundhara kANdam 21.15 “ananyA rAghavENAham” (I am inseparable from SrI rAma). kURALum … – Having a unique body which can individually (part-by-part) be occupied by aforementioned personalities. They have full control over their own regions so that pirAtti’s assistants will not come and disturb those dhEvathAs’ regions and those dhEvathAs’ assistants will not come and disturb pirAtti’s region. His divine form is even more glorious than his divine nature. His divine form is the abode for everyone. And I have lost such easily approachable/attainable emperumAn. kulam kulamA – Have I lost him due to having hurdles in embracing him? Previous section is similar to samkshEpa rAmAyaNam “kOnvasmin sAmpradham lOkE guNavAn” (Who is the one with the most auspicious qualities in this world at this time? ); this [section] is similar to “vIryavAn” (who is the one with valour?). Groups and groups of demoniac people. nIRAgum padiyAga nirumiththu – As said in SrI bhagavath gIthA 11.33 “nihithA:pUrvamEva” (They have been already killed by me [through my will]). When [dhuryOdhana] declared he does not need any of you [pANdavas], I vowed that they will be burnt to ashes. 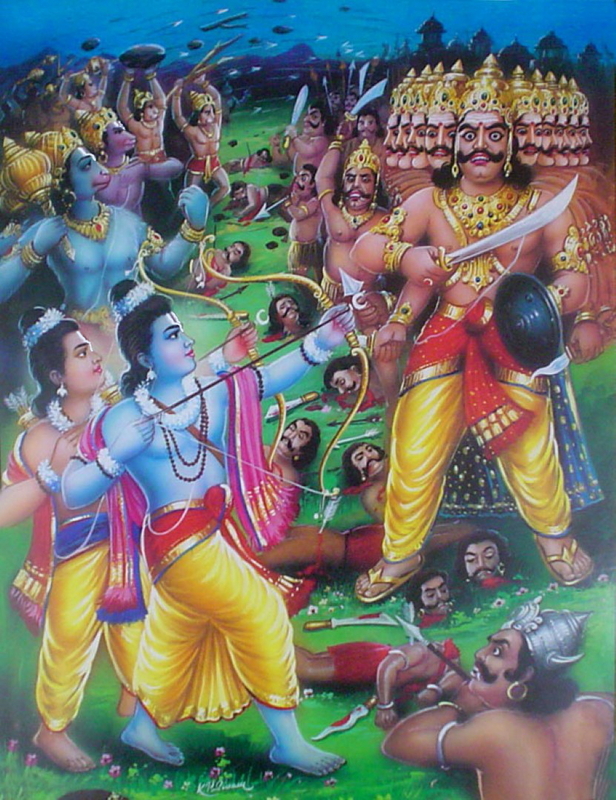 padai thotta – The same emperumAn who creates the universe through his divine will, physically jumps out with his weapons when it comes to destroying the enemies of his devotees. During srushti (creation) etc, he would remain sathya sankalpa (one who has accomplished will/vow) and for the enemies of his devotees, he wourld remain asathya sankalpan (would even lie to have them destroyed). nIRAgum padiyAga – As said in SrI rAmAyaNam yudhdha kANdam 94.22 “chinnam binnam Sarair dhagdham” (one who was cut, cleaved or burnt by the arrows), he will vow to turn them into dust and take up arms [to accomplish that]. As said in “yagyavignakaram hanyAm pANdavAnAnchadhurhrutham” (I will torture those who create hurdles for yAgams (fire sacrifices) and who trouble pANdavas), he will attack those who strangle my neck [causing hurdles for yagAms] and those who attack my life-spot [pANdavas, his devotees are like his life]. mARALan – majestic/firm; enemy. When dhuryOdhana invited krishNa to eat at his residence he refused saying as in mahAbhAratham udhyOga parvam 74.27 “dhvishadhannam na bhokthavyam cha dhvishantham naiva bhOjayEth” (Neither can one consume the food given by one’s enemy, nor can one feed one’s enemy), will argue considering his devotees’ enemies as his own. kavarAdha – After the enemies have been killed [in the fight], when he is thirsty and needs water, if he does not arrive and embrace me, I have no desire for my beautiful complexion. Only when he likes my complexion, there is use for it; when that liking is not there in him, it is only a hurdle. This entry was posted in thiruvAimozhi, thiruvAimozhi 4th centum on March 27, 2017 by Sarathy Thothathri.